PDF Proofreading Marks allow you to use traditional editorial marks in a digital workflow. 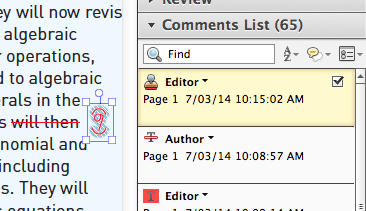 PDF Proofreading Marks are a great complement to annotations/comments in Adobe Acrobat. All proofreading marks show up in the ‘Comments List’ and can be checked off when taken in, as shown below. The benefit of using PDF Proofreading Marks is that you can quickly visualise changes, which you can’t do with annotations/comments alone. Nikki M Group worked with an editorial team who implemented PDF Proofreading Marks on Signpost Mathematics, a series consisting 18 titles. The entire production process was electronic with all corrections marked up in PDF files. This process saved paper, printing costs, delivery expenses and time. The following steps will load PDF Proofreading Marks into Adobe Acrobat. Quit Acrobat if it is open. 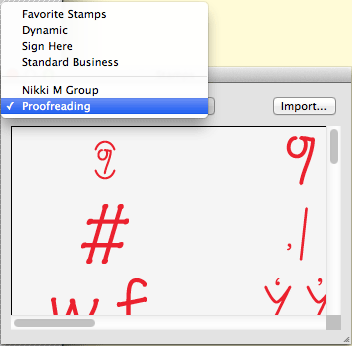 Download and place the file pdf-proofreading-marks.pdf in your Acrobat ‘Stamps’ folder. The ‘Library’ folder can also be found using the ‘Finder’ menu ‘Go > Go to Folder…’ and entering ‘~/Library’. If the ‘AppData’ folder isn‘t visible, go to the ‘View’ menu in ‘File Explorer’ and make sure the ‘Hidden items’ option is ticked. PDF Proofreading Marks will be available in the ‘Stamps Palette’. See ‘How does it work?’ on the right. Once you have installed PDF Proofreading Marks in Adobe Acrobat the following steps will show you how to apply the marks in a PDF file. You can also download the guide using-proofreading-marks.pdf to see the editorial mark up. Open the PDF file you want to edit and click on ‘Comment’ in the ‘Toolbar’. 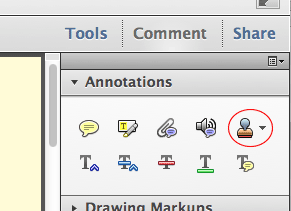 Locate the ‘Stamp’ tool under ‘Annotations’. 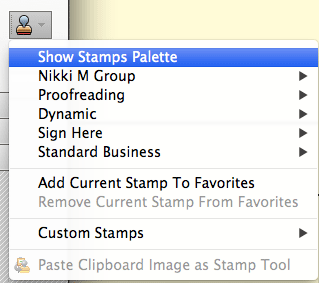 Click the ‘Stamp‘ tool and choose ‘Show Stamps Palette‘. Select ‘Proofreading’ from the dropdown menu. Click on a proofreading mark you want to use and then click on your page. The mark will appear on the page for you to move into position. While Nikki M Group Pty Ltd has made every effort to create PDF Proofreading Marks as a useful tool, we do not guarantee that it is free from defects. PDF Proofreading Marks is provided ‘as is’, and you use it at your own risk. We make no warranties as to performance, fitness for a particular purpose, or any other warranties whether expressed or implied. No oral or written communication from or information provided by Nikki M Group shall create a warranty. Under no circumstances shall Nikki M Group be liable for direct, indirect, special, incidental, or consequential damages resulting from the use, misuse, or inability to use PDF Proofreading Marks, even if Nikki M Group has been advised of the possibility of such damages.